2013 EuroBasket Women Group E: Who will join Spain and Turkey in quarter-final? EuroBasket Women Group E was always going to be difficult to predict after the elimination of Russia in the preliminary round. And now we have a final day scenario that involves a possibility of two three-way ties between Italy, Montenegro, Slovak Republic and Sweden for the two remaining places. Spain and Turkey remain unbeaten and meet each other in the final match to determine who will advance to the quarter-final as group winners. Although Italy are currently in third place with two wins, only a victory against Montenegro will guarantee them a place in the quarter-final. In case of defeat and a victory for Sweden, then the calculator will be needed to determine which team is to be eliminated between Italy, Montenegro and Sweden. For the Slovak Republic to qualify, first of all Italy need to beat Montenegro and then the Slovak team have to beat Sweden by at least 18 points. In the first game between the Slovak Republic and Italy everything was nicely balanced (20-20) despite neither team playing well. The Slovak Republic appeared to have lost their game after the break. Italy took full advantage with an 18-4 run to finish the quarter leading (40-29). Italy did not allow the Slovak Republic to get back into the match as the final quarter fizzled out with Italy winning (58-47). For Italy Giorgia Sottana was on top of her game with 22 points and 5 assists. Although this victory improves Italy's chance of qualification for the EuroBasket Women quarter-final, neither side is safe from elimination. In the best game of the day, the supporters from Sweden and Turkey were given a treat for the first 20 minutes in which the two teams played fast aggressive basketball. Turkey managed to edge the first half (31-26) despite having Quanitra Hollingsworth sit out most of the time with 3 fouls. After the break, Turkey's shooters from long range finally broke down the Swedish defense and swung the game in their favour. A base-line three-ball by Yasemin Dalgalar from Turkey with 23 minutes played was a kind of knock-out blow and more or less signalled the end of the contest for Sweden (42-30). Turkey did not let up with points coming from all over the court as they stretched the lead to 18 points (55-37) by the end of the quarter. Sweden on the other hand did not give up with the match becoming physical at times. Yet Turkey were not going to be denied and maintained their calm to win (72-51). 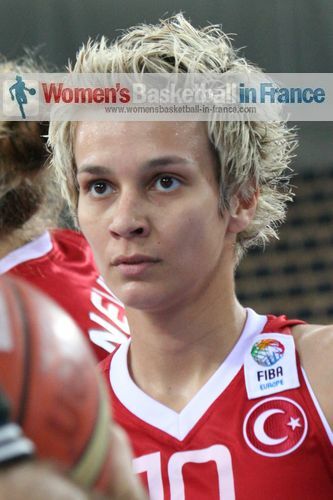 Isil Alben (above in picture) who had 8 points in the first quarter finished as top scorer with 15 points. Dalgalar and Hollingsworth contributed 11 and 10 points each. For Sweden Frida Eldebrink and Anna Barthold had 15 and 10 points each. In the final match of the day Spain ran out winners against Montenegro (66-50). Sancho Lyttle was again the most dominating player on the floor with 21 points and 11 rebounds. Four players scored 9 points: Cindy Lima, Elisa Aguilar, Alba Torrens and Marta Xargay. 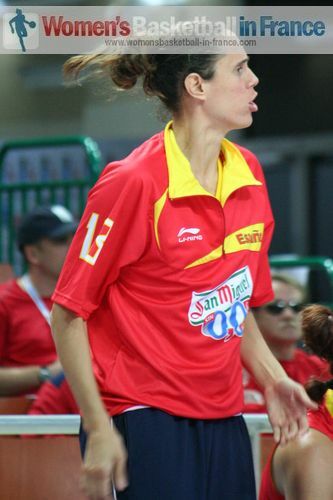 However the day belonged to Spanish international Amaya Valdemoro (in picture) who made her 254th appearance for Spain which is a new national record. Montenegro failed once again to produce the basketball that made them one of the most interesting teams of EuroBasket Women 2011 as they never challenged Spain. Iva Perovanovic did her best for Montenegro with 19 points, but with her side having a poor shooting day, her efforts were in vain.